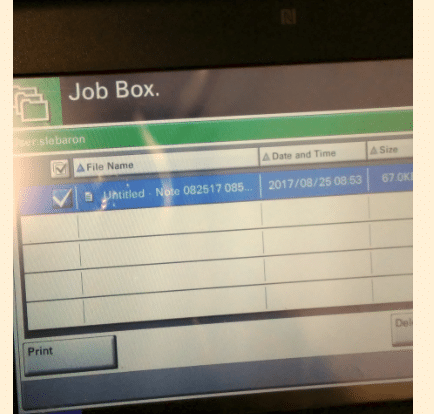 Do you have confidential things to print? But then you have to print the document and race down to the copier to try to get the printout so it’s not just sitting there for anyone to see? Or maybe it’s special cardstock and you have to time it just right so another person’s job doesn’t get in front of yours and accidentally prints their job on your cardstock? Well, you can now do “Private Printing” to the new copiers. You print from your desktop as usual, but then you go to the copier and “release” that document for physical printing while you’re standing at the copier. Here’s (1) how to connect to this and (2) how to use it. Step by step with illustrations if you need it. I’ll post this to our Staff Resources section on our website soon, too. By default we are connected to the copiers just as normal printers. Print there as usual and everything will be the same. 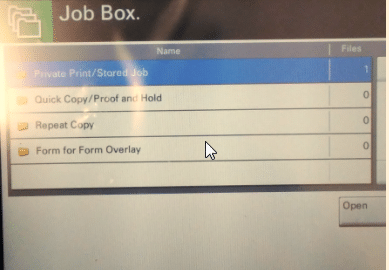 To use Private printing, however, you’ll need to connect to that copier (once – to get it installed on your laptop) so it’s available for your use from then on. Hit the Start key/Windows key (lower left hand button) and type in \\d19-files\ and hit Enter. This will show you all the things that are shared on that server named d19-files. 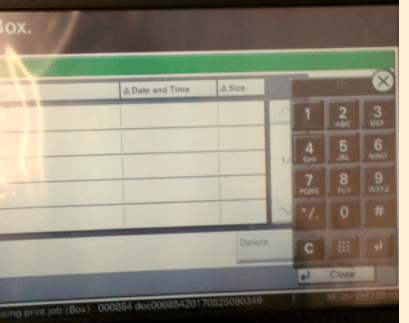 From here, just find the printer you want to connect to and double-click it – it will connect, install any drivers (software) it needs, and it should then be available for you to print to from that point on. Here’s a portion of a screen shot from when I type in \\d19-files\ and hit Enter that show me selections I can choose. 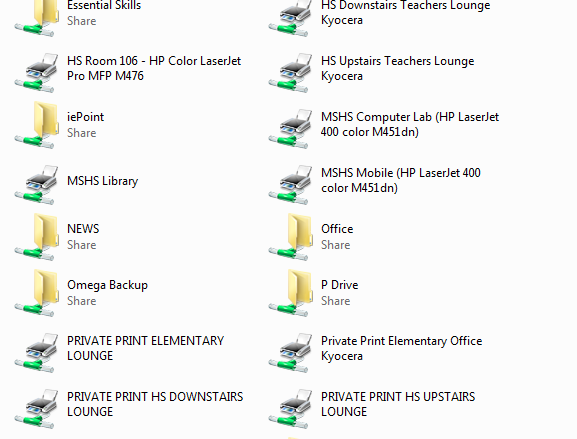 Note the PRIVATE PRINT options – double-click on one of them to have that copier be available to you in Private Mode. It will install as normal. To use this feature, print as you normally do, but select the Private Print copier from your printer list. You will be prompted for your access code as usual to allow you to print, but then it will ALSO ask you for another code. 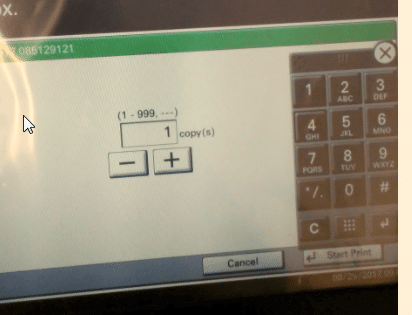 You can use the same code or any numbers you want – but remember what you type because you’ll need this code to release the job for printing at the copier. After you print, whenever you want to, go to the copier and login with your normal access code. 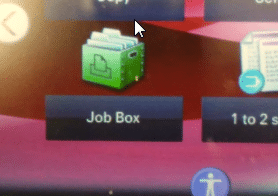 Touch the Job Box button. Touch the Private Print line and touch Open. Touch the print job(s) you want to print (you may have more than one if you printed a few things) to put a checkmark by it and click Print. Enter the code you created when you initially told it to print – I told you to remember that! Hit the + or – to let it know how many copies you want and hit Start Print – it’ll then print your job. 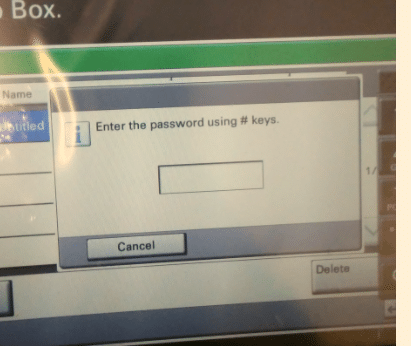 Hit the X and Close this window and logout of the machine as usual if you’re done.